What better way to catch up after the summer than meeting for a drink at a spectacular new location with a breathtaking view? Join us on the roof of Palazzo Pamphilj at the new bar dubbed "La Grande Bellezza" (The Great Beauty, a reference to Paolo Sorrentino's award-winning 2013 film tribute to Rome). 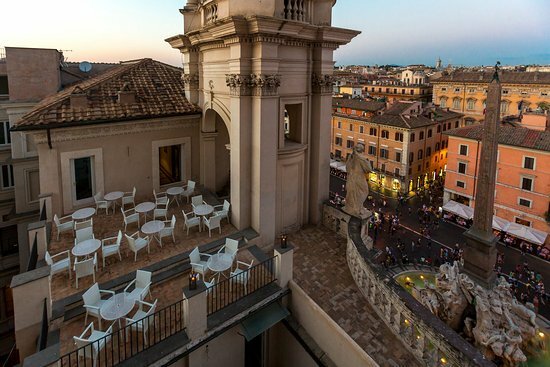 Part of the recently opened Eitch Borromini Hotel, the rooftop is accessible from the 6th floor and offers an incredible 360-degree panorama encompassing the iconic Piazza Navona and countless other sights. It truly has no rivals. The hotel also has a large display of contemporary artwork in the Borromini Art Gallery on the 4th floor -- in addition to more wonderful views from the windows on that floor. Members of the CCR executive will be on hand at this informal get-together in this refined setting, so you could take the opportunity to pay your membership dues or for our official club season opening party later this month. Or just come for a chat, a drink and some laughs! And catch an unforgettable sunset. Cost: A la carte/pay-as-you-go, each paying for their own order. RSVP to canadarome@gmail.com ATTN Diana. Booking is required as space is limited and the rooftop cannot be accessed without a reservation. First come, first reserved, but priority will be given to ongoing CCR members. You will be held financially responsible for your reservation if you fail to attend after reserving a spot.